3D graphics in the browser have been a hot topic ever since it was first introduced. 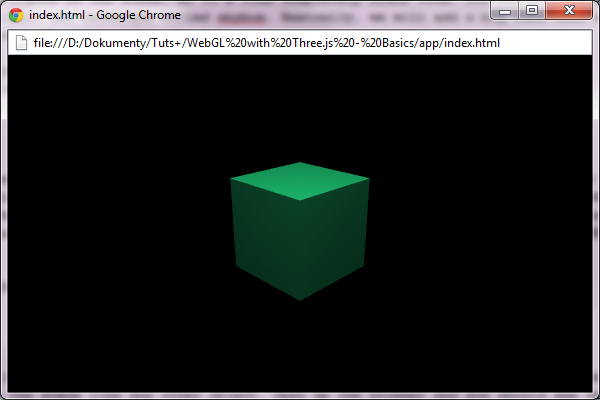 But if you were to create your apps using plain WebGL, it would take ages. This is exactly why some really useful libraries have recently came about. Three.js is one of the most popular, and in this series I will show you how best to use it in order to create stunning 3D experiences for your users. Before we begin, I do expect you to have a basic understanding of 3D space before you start reading this tutorial, as I won’t be explaining stuff like coordinates, vectors, etc. Three.js uses the concept of a display list. It means that all objects are stored in the list and then drawn to the screen. Three.js uses the concept of a display list. This means that all objects are stored in the list and then drawn to the screen. Here, this is a THREE.Scene object. You need to add any object you want to be drawn on the screen to the scene. You can have as many scenes as you want, but one renderer can draw only one scene at once (of course you can switch the scene that is displayed). The renderer simply draws everything from the scene to the WebGL canvas. 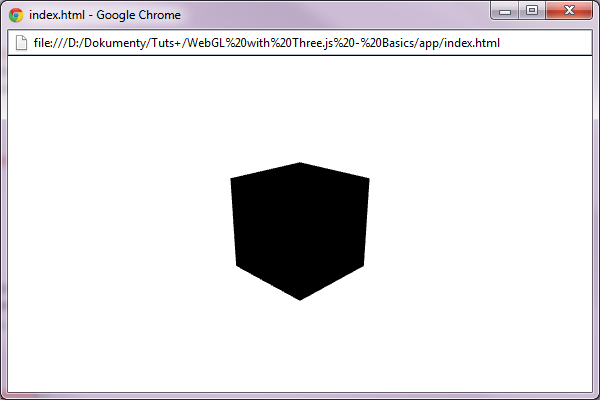 Three.js also supports drawing on SVG or 2D Canvas, but we will focus on WebGL. 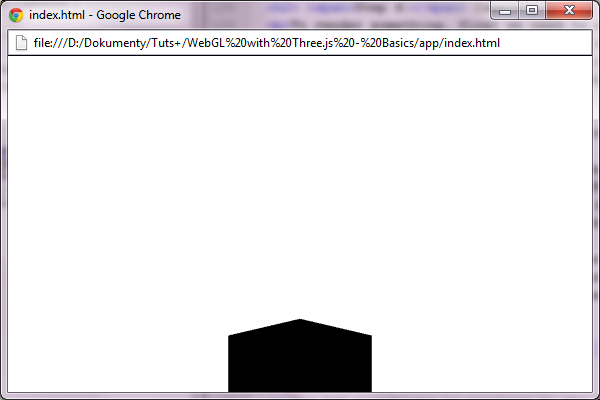 The first line defines the WebGL renderer. You can pass the renderer’s options in the first argument as a map. Here, we set the antialias to true, because we want the edges of objects to be smooth, not jagged. The second line sets the renderer size to the size of the window, and in the third one we add the renderer’s canvas element to the document (you can also do this using a library, like jQuery: $('body').append(renderer.domElement)). The last one defines the scene, no arguments needed. As you can see, first we create the geometry. The arguments are defining a size of the cube: the width, height and depth. Next, we define the cube’s material. There are a few material types in Three.js, but this time we will use the THREE.MeshLambertMaterial, since we want to have some lighting later (this material uses Lambert’s algorithm for light calculations). You can pass the options in the first argument as a map, the same as with the renderer – this is pretty much a rule for more complex objects in Three.js. Here, we only use color, which is passed as a hexadecimal number. On the third line, we create a mesh using the geometry and material created earlier. Next, we rotate the cube by 45 degrees on the Y axis, to make it look better. We have to change degrees to radians, which is handled by the equation you probably remember from your high school physics class: Math.PI * 45 / 180. Finally, the cube is added to the scene. Now you could open index.html in your browser to see the results, but you will see nothing because the scene is not rendered yet. Creating the camera is a bit more complicated than the rest of the things we’ve done so far. The first argument defines the FOV (field of view), the angle that can be seen from where the camera is. A FOV of 45 degrees looks natural. Next, we define the camera’s ratio. This is always the width of the renderer divided by its height, unless you want to achieve some special effects. The last two numbers are defining how close and how far the object can be to the camera to be drawn. The z coordinate is positive in the direction of the viewer, so objects with a higher z position will appear closer to you (in this case, since we moved the camera, all of the objects will appear further away from you). This code is similar to the one that creates the cube. But this time the geometry is much bigger. We’ve also used THREE.MeshBasicMaterial since we don’t need to light the skybox. Also, notice the additional argument passed to the material: side: THREE.BackSide. Since the cube will be displayed from the inside, we have to change the side that gets drawn (normally, Three.js draws only outside walls). But the cube is still pretty boring. Let’s add some movement to it. Add this line between the renderer.render and the requestAnimationFrame calls in the render function. It’s simply subtracting the time passed from the cube’s rotation on the Y axis (remember that it’s in radians) to rotate the cube clockwise. Now open the browser and you should see your cube rotating clockwise smoothly. In this part of the series you learned how to prepare the scene, add objects and lights, and how to animate things. You can experiment with the app, add more or different objects, lights. It’s up to you. Next time I will show you how to use textures and how to create some nice effects with particles. Don’t forget to take a look at the documentation if you are having any problems.